Using a green screen allows us to superimpose different backgrounds behind presenters, interviewees and products. This technique may be useful for budget purposes, such as a desired location being too expensive to film in, or for technical reasons such as a location being too loud, busy, or simply a health and safety challenge. With a suitable background photo or video clip, we can make you or your subject appear almost anywhere. In addition to our studio-based green screen facilities, our portable green screen kit allows us to use this technique in all kinds of locations. With a portable green screen we can transform the corner of your office into the location of your dreams… or at least a location that’s more inspiring than the corner of your office. 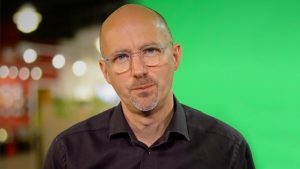 Want to find out how we can use this technique within your next video project? Contact us. In and of itself, a green screen doesn’t actually do very much. They are typically large cloth backdrops or walls that have been painted green, like the green screen wall in our studio. They don’t have any special functionality that makes the effect work. 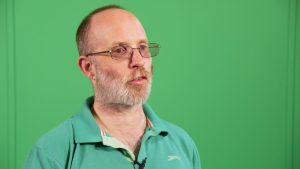 The “green screen” effect relies on a technique called Chroma Keying. This can be used with any colour, which is why blue screens were used in the past, but luminous green is not a colour that’s typically found in clothing or people’s skin. When applied, the Chroma Key will remove any green within the video, allowing our editors to place another image or video of your choice in the background. 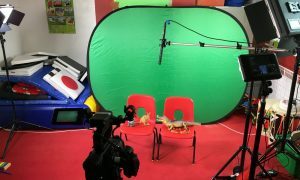 The primary benefit of using a green screen is the ability to digitally place the subject of the video in a location where it wouldn’t otherwise be possible to film them. In Hollywood, this means rendering actors in fantasy worlds or on other planets. In the world of corporate video, the reasons are usually more modest. For example, filming an interview off-site due to noise issues or health and safety reasons, then superimposing an image of the site behind the interviewee. We’re often asked about what should be worn in front of a green screen. The simple answer is “anything but green” – so don’t wear a shirt like the one pictured! As mentioned above, the Chroma Key process removes a specific colour from an image, so wearing the colour we intend to remove can cause problems. Other than that, there are no special requirements beyond our usual suggestions for what to wear on camera. 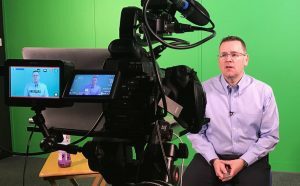 We’ve had the pleasure of filming a variety of corporate videos against a green screen; from training and educational material to interviews for promotional videos. Our studio in Southampton is home to a permanent 4.6m wide floor-to-ceiling green screen, and we have portable pop-up green screens for use on location. We also use professional cameras which can record in a high enough resolution and bit-rate to get a smooth and effective result.